A new version of the General Atomics Predator/Reaper UAV series with multiple sensor control is ready for deployment to Afghanistan after successful trials. 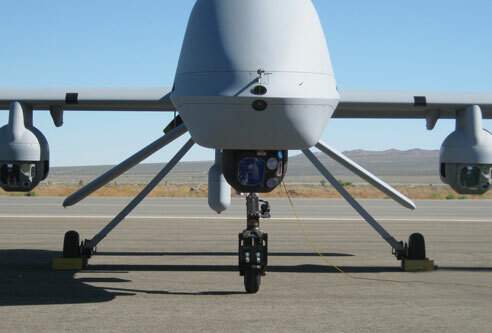 A U.S. Army MQ-1C Gray Eagle was fitted with two additional EO/IR sensors under each wing. These were controlled by operators in the field, who were independent of the main ground control station (GCS). While the primary Raytheon AN/AAS-53 common sensor payload (CSP) under the nose was operated via a Ku-Band tactical common datalink from AAI’s Universal GCS, two similar Raytheon DAS-2 sensors under the wings were operated by soldiers using a bidirectional one system remote video terminal (OSRVT) and Aerovironment’s mini-universal GCS designed for use with Raven and Puma small UAS. Like the U.S. Air Force Reaper, the Gray Eagle additionally carries General Atomics’ own Lynx multi-mode surveillance radar. The new sensor/control combination is named Triclops. It was tested in the Army’s manned/unmanned systems integration concept (Music) exercise last September. The additional sensors are carried on the inner wing hardpoints, leaving the outer wing hardpoints free for Hellfire missiles, laser-guided bombs or other weapons. Carriage of the additional sensors requires no modification to the UAV’s power generation system. The U.S. Army first deployed four Gray Eagle UAVs to Iraq in December 2009. Four additional aircraft were sent to Afghanistan in September 2010. An earlier version named Sky Warrior was deployed to Iraq in 2006, and is also now in Afghanistan. These UAVs were all acquired using quick reaction capability (QRC) contracts. The main Gray Eagle contract provides for 34 more aircraft and 16 GCS, for delivery beginning in December.